After Immigration and Customs Enforcement agents raided 7-Eleven stores nationwide and arrested 21 undocumented workers, the chain’s consumer perception fell to its lowest level since December 2015, according to YouGov BrandIndex. Interestingly, the chain took a hit with both self-professed liberals and conservatives, too. The incident did seem to put a slight chill in 7-Eleven’s purchase consideration, an indicator of potential sales revenue. On January 10, the day of the raids, 6% of consumers said they’d consider buying something at 7-Eleven the next time they were shopping for groceries. That number dropped a couple points to 4% by last weekend. Consumers may have gotten skittish about grocery shopping at stores that ICE is clearly targeting. 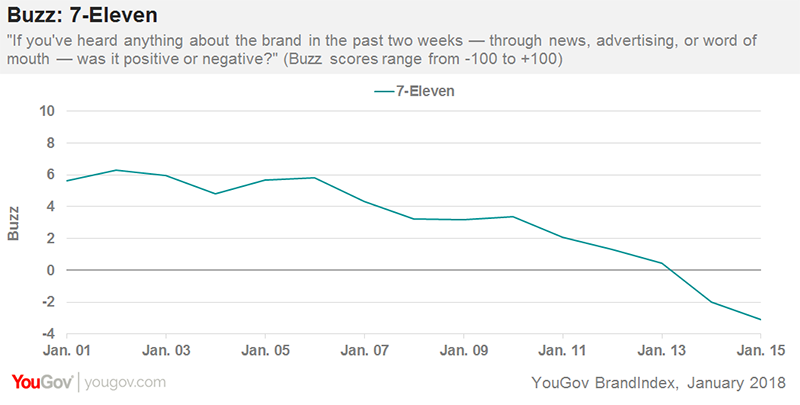 YouGov BrandIndex measured 7-Eleven’s consumer perception using its Buzz score, which asks respondents: "If you've heard anything about the brand in the last two weeks, through advertising, news, or word of mouth, was it positive or negative?" Buzz scores can range from -100 to 100 with a zero score equaling a neutral position. Purchase Consideration asks: “When you are next in the market to purchase groceries, from which of the following would you consider purchasing?” Purchase Consideration scores can range from 0 to 100%.